Dear Eugene-- Today I spent most of the day painting the barn during which time I was reflecting on how far we've come since starting this project last year. Although I have a lot of finish work still left to do, it occurred to me that I should thank you, Ruvim, and that great framing crew for giving me such a well constructed and useful structure. 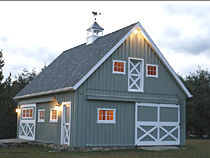 I think the most wonderful aspect of the building process was that I could configure the barn exactly the way I wanted to suit my needs. Being able to work with CAD programs and making changes via email was such an easy way to communicate ideas and changes back and forth between us during the planning stages. Also, any of the changes and upgrades that I wanted were simple and inexpensive, not like some of the other companies I researched and saw in my travels, where everything other than the basic package added a considerable up charge to the price. I got a lot of barn for the buck, without any complications or surprises along the way. Thanks again, and do not hesitate to send prospective customers in the Northwest New Jersey area to see for themselves the quality of your work. I wanted to take a moment to thank you all for a job well done. I cannot express to you how incredibly happy my husband and I are with our new barn. I have never had such a wonderful experience with new construction in the past. But your company made having this barn built an absolute pleasure. The daily clean up of the site made it appear that there was no construction going on at all on our property. Your company has set new expectations for future construction for us. Your employees at all times conducted themselves in such a professional courtesy way that walking around the construction site was easy to do. I must admit that we had a picture of how beautiful our barn was going to be when completed, but we never dreamed that it was going to be as beautiful as it turned out to be. My neighbors and even the people around town stop and comment about how incredibly beautiful our barn is. Again, I want to thank you and your staff for making this experience an absolute pleasure and joy. It's absolutely a beautiful barn-- just all my dreams come true...and the crew has been amazing - what a great group they are! I will highly, highly recommend you to everyone I know. I cannot tell you how impressed I've been. I've had many friends come over to see this structure--some with some pretty amazing farms and budgets much larger than mine--and all have simply fallen in love with the quality of work and prefer this barn to any of their own...no matter how big or fancy theirs may be!! Next year in October, when my house is on the big Chester County Day tour, I plan to include the barn in the touring and will put up a sign inside, telling people who built it and how to contact you. Thank you so much. I'll miss having the crew here, even though I'm glad to see the barn coming to its finish. They are so wonderful men--You have a company to be quite proud of! Please refer anyone you'd like to me for a reference about my experience with your company. Love the barn and a few people asked me for your website after seeing pictures. Also, your driver was amazing!!!! Thank you again! The barn is beautiful. We are extremely happy and thank you for making this a great experience. I would highly recommend you and Ruvim. If we ever need another in the future I would order from you again. My wife and I received our barn last Tuesday, May 10, and we are so pleased with everything that I had to drop you a note of appreciation. 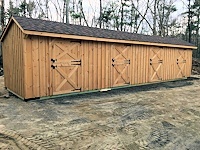 The barn was originally scheduled to be delivered Thursday, but we were contacted and asked if we could accept delivery 2 days earlier (which we were thrilled to do). My experiences have shown that it's a rare company that even meet their promised delivery dates; beating them is nearly unheard of. the leading edge of the barn in transit. But before we could even ask about it, the driver placed a stack of matching shingles inside one of barn stalls. I got the impression that if he hadn't been on a tight schedule, he might have offered to install them for us! When we originally were "shopping around" for a barn, we asked several local builders for quotes (we live in central Massachusetts). None of them could come close to your prices (including delivery!). We happened to have one of those local builders on-site at the time the barn was delivered, renovating a room of our house. Naturally, he was very interested in inspecting the barn's quality, since he knew how inexpensive it was. He was amazed and had nothing but praise for how solid and well-constructed the barn was, and ended up saying that we indeed had made a good choice. Thank you again for your superior product and service. Feel free to use any of my comments as endorsement testimonials. Hello, I just wanted to send you a line and tell you how well built my running shed is.... really do good work you guys. The driver was such a nice guy too. Hope you well and wish you much success and if any one should ask me I will give them your name and number. I wanted to express my thanks and gratitude for the great shed you delivered on my property last month. You were able to build the shed very quickly to fit with my timeline and you delivered it just in time before a big snow storm. Your driver, Anatoly, was also very sick the day of delivery and made the trip all the way to New York to beat the weather. He also expertly replaced a few shingles that blew off during the trip. I am very impressed with the quality and workmanship of the shed. I have attached some pictures for you and feel free to use this letter or the pictures on your website. My horses love it too! I wanted to thank you (Gene) and your delivery personnel for the high level of professionalism I have received from start to finish. The barn looks GREAT, and is WELL built! Your delivery men took great care in the precise placement of the barn My site location was not your typical delivery. They did a great job. Love our barn! Total Strangers are wandering in to look at it and asking for the name of the builder - of course we're giving you wonderful references! 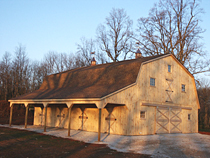 Alan Ullery - Mercersburg, PA (36'x36' modular barn with 8' lean-to). My barn is beautiful. I've waited a long time for this and I am delighted in my choice of you as the supplier. Your driver was incredible. He managed to maneuver that thing through the tightest places and drop it precisely on the spot. It's been a pleasure doing business with you. I'm recommending you to anyone who asks. Everything looks great on the barn. Anatoly did an excellent job driving in and setting it up. We took pictures and will send to you. Thanks for all your help. Your guys did a wonderful job building it. The shed row was delivered yesterday. It really looks beautiful. Your crew did a great job dropping it in just the right spot. I wanted to let you know how happy we are with your product. Well built, fair price, and you are a man of your word. We will be calling you for more units soon. Hello Eugene. The barn is absolutely gorgeous. The workmanship is wonderful. I couldn't be happier. I will be purchasing another one in the spring!